Anyway, I decided to bring a bit of the story time here, featuring two celebrities reading. And, I chose these two because a) it reminds me of grandparents reading to me and b) the stories are so classic and wonderful and begging to be shared again and again. First up, Ms. Betty White reading Harry the Dirty Dog, which for me is one of my favorites as a young reader. Next up, Ernest Borgnine reads The Rainbow Fish. He makes me want to smile and say “Thanks, grandpa” (and I can totally imagine my grandpa reading this to me, well, after we watch some football, that is – hehe). Hope you enjoyed those reads. What are some of your favorites out there? Do tell. I’m always on the prowl for more good reading material. Sometimes I feel like my mind is gone. I do a task; it helps a bit. Then, I realize there’s more to do. Games amuse me, if only slightly. Reading comforts, for it’s another good escape. But, can’t escape forever, tasks beckon again. How can I get it all done? Sighs deeply. …for whatever need of the moment. Is it silly? Perhaps. Selfish? Probably. There’s an old religious saying: God only gives us as much as we can handle. But, sometimes I wonder why the burden has to be so great. Here my pensive thoughts lead to sadness again… we can’t have that for long. Time to shake things up…I’m going to shake it out. What rut are you in at the moment? And, how can we use it for something good? Who am I kidding, no one’s watching. Besides, I’m not masochistic. *dances naked in blog* How freeing. Whoa…I think I just put out an eye, so stopping again. The dancing…not the blogging, yet. Speaking of books, my Twitter followers know that I have recently enjoyed a few books, and an oral storytelling of Coraline by the fabulous Neil Gaiman and friends via his site. Unfortunately, I looked at my Twitter stats recently and saw a big dip — okay, okay. I’m taking the hint…I think. Maybe the wrong hint…time will see, I guess. Oh crud…real life is calling again. Answering machine is full, so I guess I’d better go before…oops, too late. Pot boiling again. Talk among yourselves until I return. *hands out virtual pie for Pi Day* Happy 3.14! It’s Tuesday. The weather is cold and rainy. Inside, though warmer, emotions are taut and worn. I have another book hangover from finishing another series. To help myself recover, I’m playing a book game with you all, called “Teaser Tuesday”. Anyway, back to napping…to aid the cause, sharing my napper, whom seems to be way ahead of me. 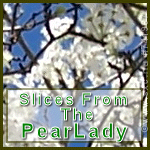 Content with blog ©ThePearLady, when not otherwise noted. Want to help me cook? Subscribe to our Delicious Fruit! We like the Pear Lady’s Pie! Want to Get Paid for just looking at an ad? Time is a companion that goes with us on a journey. It reminds us to cherish each moment, because it will never come again.